This stained glass lamp is a reproduction of a Tiffany Woodbine lampshade on a Small Stick Base. 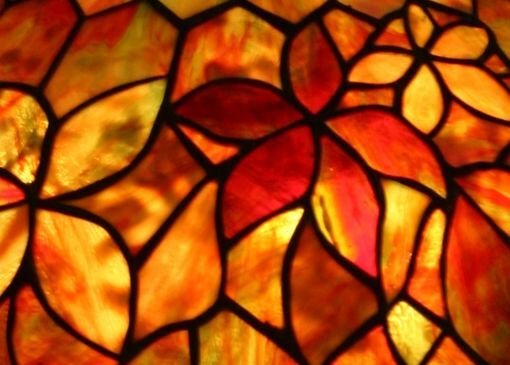 All of the leaf and backround pieces were selected from 1 sheet mix of orange, red and green glass. The lamp was paired with a Small Stick Base with 3 light cluster. It is made of solid brass that was copper platted and then finished with a green/brown patina. Lamp dimensions 16" Dia. X 20H.